Stress is often a sign that you have “too much on your plate.” When you have more responsibilities, tasks, and other commitments than you can handle, you end up with chronic stress, feeling burned out, and incapable of dealing with your normal, day-to-day life. 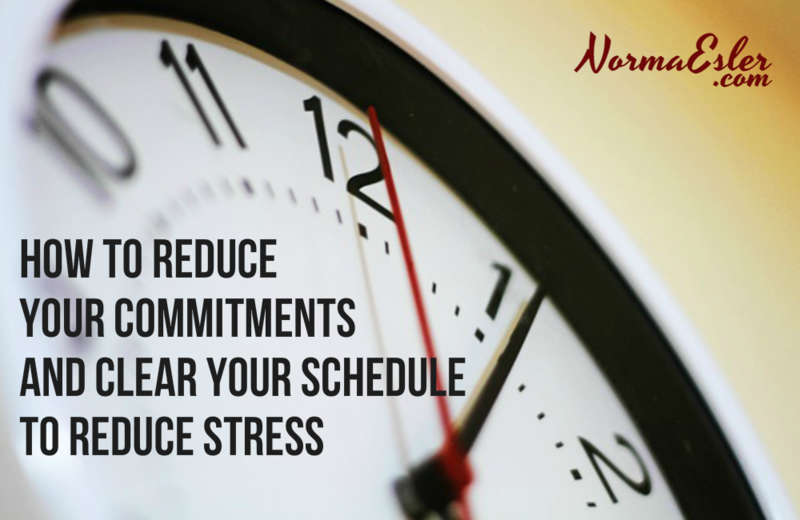 Here are some tips on how to reduce your commitments and clear your schedule to reduce stress in your life. When you have too many commitments to keep up with, it is only natural to feel a sense of failure or depression when responsibilities are not handled. This is a sign that you are a responsible person. You have made commitments or had tasks handed down to you, and you work very hard to accomplish all of them. Sometimes though, there don’t seem to be enough hours in the day. Your personal and business responsibilities, as well as social activities, seem to pile up one on another until you experience constant stress, rather than a sense of accomplishment. This is a sign that you need to prioritize your world, and stop saying “yes” every time you are asked to help out. What is really, truly important in your life? Ask yourself this question about your job, family, and yourself. Be very honest here. Understanding what needs to be done, and what you want to get done, as well as what you should ignore, helps you plan your day so that your most important responsibilities are handled first. This is where a tool like My Inspired Year Weekly Planner can really help. Get your copy and see how it can make a difference in your life. Write down everything you need to accomplish today, this week, this month and this year. Without writing it down, and simply relying on your memory, you risk missing what’s really important. Once you have your to-do list in front of you, circle or check those activities which only take a few minutes to finish. Your list of responsibilities for today might contain 15 items. Taken as a whole, that list can look pretty daunting. You are thinking about every task and commitment at the same time, but you can’t accomplish more than one thing at a time. Look at each item on your to do list individually. By grouping together those responsibilities which can be completed in a few minutes each, and then attacking them accordingly, you can often knock out a large part of your responsibilities in a short period of time. If you are burned-out you can’t help anyone, including yourself. Clear time in your schedule for “me” activities. You may be surprised that by making time for yourself throughout your busy schedule, you are more productive, and capable of accomplishing all of your scheduled activities and commitments. With My Inspired Year Weekly Planner, you always have a reminder to keep a sense of balance in your life. If you don’t have your copy yet, order today to see how you can bring order and reduce stress for a happier life.